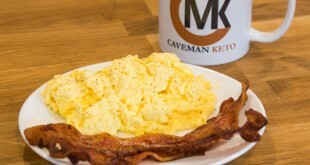 This is another simple recipe that can yield an entire weeks worth of keto friendly breakfasts. Its very simple and can be customized as many ways as you can imagine. 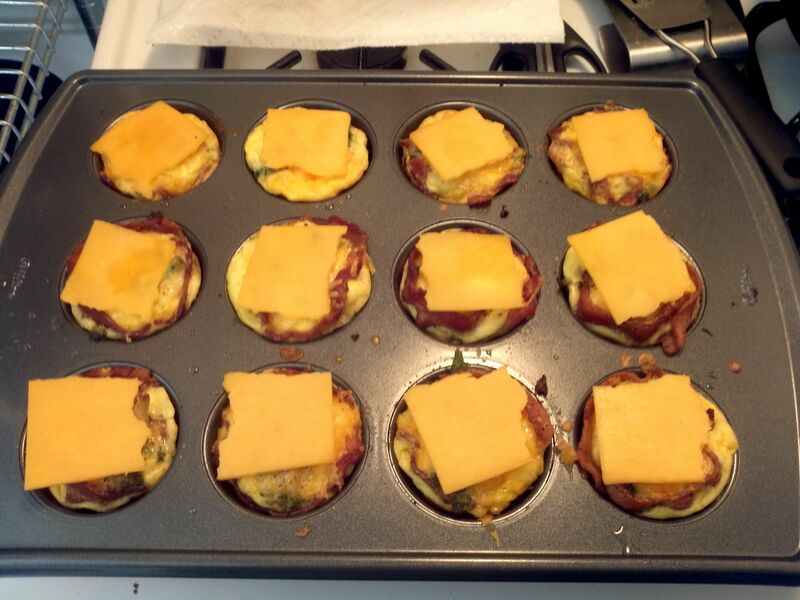 Its basically a full keto breakfast on the go in muffin form. 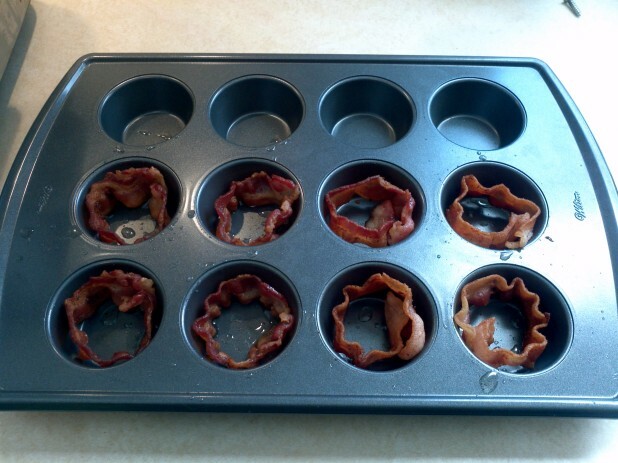 The first step is to cook some bacon up and put it around the ring of the muffin pan. Make sure to be quick about it because the bacon will harden pretty quickly. 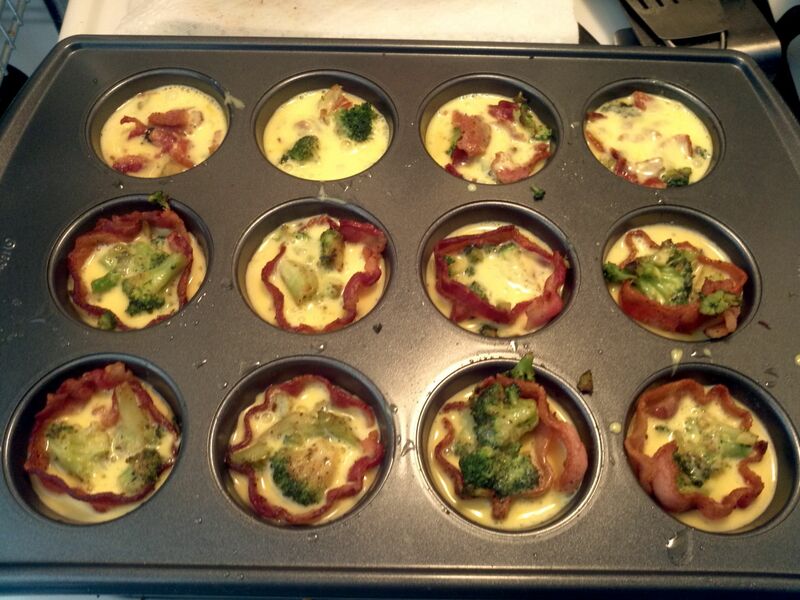 You’ll note that I only filled 8, my wife likes hers with crumbled bacon instead of around the edges. One thing to note is the quality of your muffin tin. The previous week I made a batch with my old pan and they stuck to the sides pretty bad. So I ordered a new muffin pan. The difference was huge. Even with muffin cups the old pan on the still stuck with the muffins. I didn’t even grease the pan shown above (well, other than a slice of bacon of course 🙂 ). Cook some broccoli up in the left over bacon grease. When they are cooked, distribute them throughout the tins. 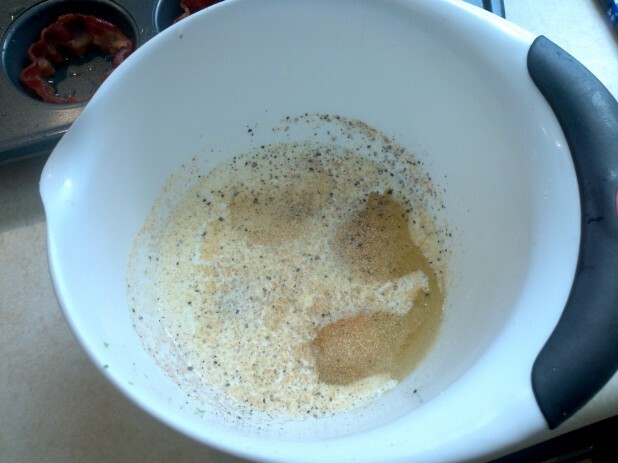 Mix together the eggs, cream and spices. Make sure to whisk it good until bubbles form. Here is the mixture after the eggs / cream have been added. There are several different variations you can do. For my wife’s I crumbled the bacon instead of wrapping it. Add Cheddar cheese to tins. 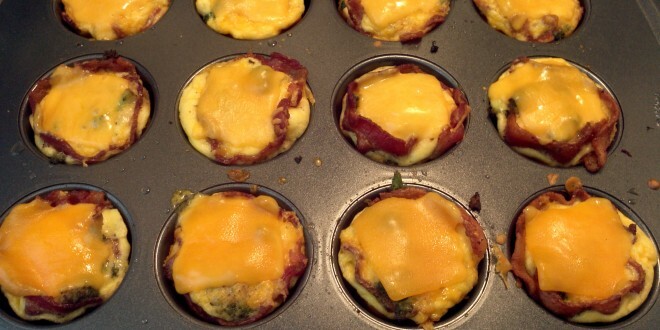 Push it into the muffin, now they are ready for the oven! Here are the muffins after baking. But don’t stop now, they are not done! Take a slice of cheddar cheese and break it into four, put 1/4 on each slice. Here are the complete muffins! Now you’re ready to conquer the week!! Cooked the bacon until close to done but not crispy, try to keep it flat and straight, might be easier to bake it. I was wondering do you think I could make these and then freeze them to reheat for a weeks breakfast? I actually make 5 days of them on Sunday, throw them in the refrigerator, and eat two each day. No need to freeze! Those are some long cook times. Not sure I can cook something for 25 months…. Thanks, these are really great. Found the link to your site via r/keto and made these this morning. Damn fine. Have a real biscuit-y flavor to them. Very good and filling. Definitely put the Pam down BEFORE you start filing the muffin tins. I have a batch in the oven right now and I used foil muffin cups. Hopefully, that will eliminate sticking. I added some tarragon and grains of paradise for the spices. Hopefully, that’s a winning combination. Just made these today, love them! Are the nutrition facts for one or two muffins? are these good reheated in the microwave? they look delicious! Only 4 eggs, 1 cup of almond flour , 1 teaspoon of baking powder . Amazing texture and flavor, keep the good posting, I blindly make any of your recipes knowing they will taste awesome. Yummy, I altered a little bit this recipe adding a cup of almond flour to bring a real muffin texture to this awesome recipe. It’s called a quiche. Many flavors and sizes. Wow, these are delicious! However, I think your calories are off, using that bacon grease will add quite a bit to your final total. I count just under 300 calories per muffin vs your 162. 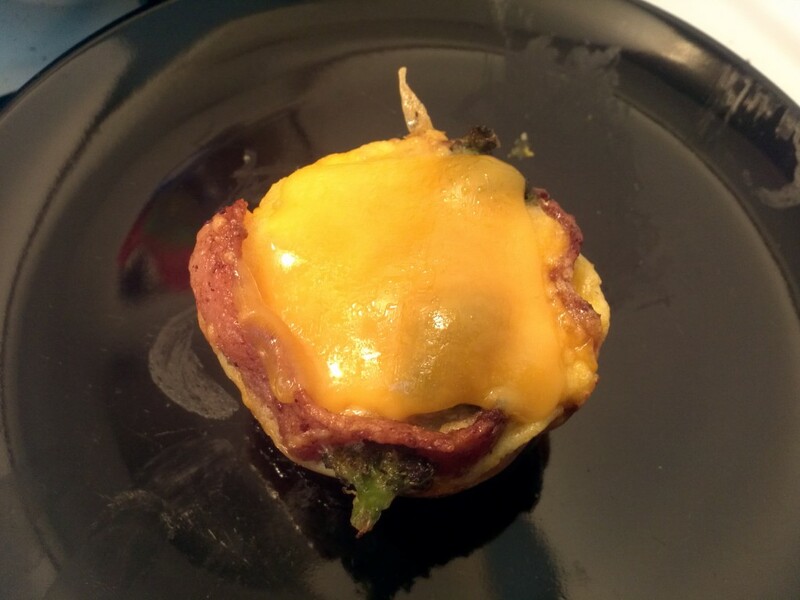 I also cooked up about 100g of breakfast sausage and crumbled it, putting it on top of the muffin just underneath the cheese (bringing my version up to 326 calories per muffin). I just made these on Sunday as they look delicious. I love them, they are perfect. I think I messed up and added way to much broccoli to them though. When I open the container the only thing I can smell is broccoli, then while eating them all I can taste is broccoli. Dont get me wrong, I love broccoli! But at 5-6 am getting a big whiff of cold broccoli then tasting only broccoli has been a little to much. I wonder what I could substitute instead of broccoli. Spinach? 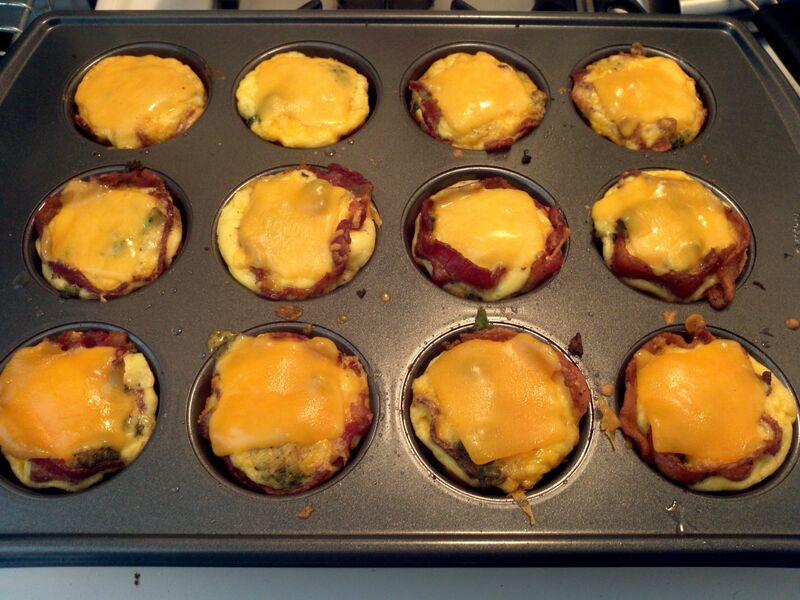 Either way, these are awesome and I greatly appreciate your site and all your recipes! Cauliflower is a good sub for Broccoli! Is the nutrition count for one or two muffins? 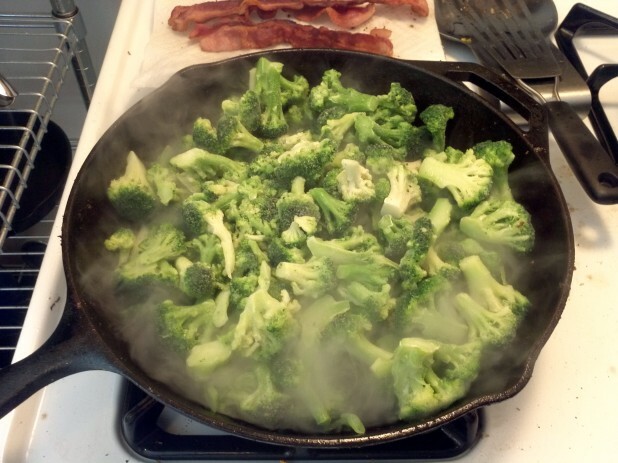 Question, is it necessary to cook up the broccoli or could you just toss it in to the mix and throw it in the oven. I would cook the broccoli, you could just microwave them, you don’t have to fry them up but if they were raw I think it would be too tough. Love this recipe. So easy. I have made it twice now. I am starting to track my macros and have a quick question.. In the nutrition facts you say 1-2 servings. Well is one serving one muffin at 162 calories? I know this is an old recipe, but I just made it and I love it! Is the nutrition label for one muffin or for two? It says 1-2 so I’m not sure. I make a similar breakfast in a large muffin pan. I have used kale or celery or bell peppers for a vegetable. It is not necessary to cook the bacon first with this method. 2) Spray the cups with non-stick cooking spray. 3) Line each cup with a strip of bacon. 4) Add vegetables to each cup. 5) Crack an egg in a measuring cup. Add salt and pepper to taste. I also add chipotle Tabasco and garlic. Add any other spices you like. Stir the egg to break the yolk and mix the spices. 6) Pour the egg into the pan. 7) Cook for 30 minutes. 8) Let cool. Remove from the pan. Use a knife around the edges if needed. 9) Refrigerate. Reheat before serving. A minute in the microwave does the trick. Pingback: Finger food ideas that are dairy, soya, wheat, tomato, fish and nut free please?!?! 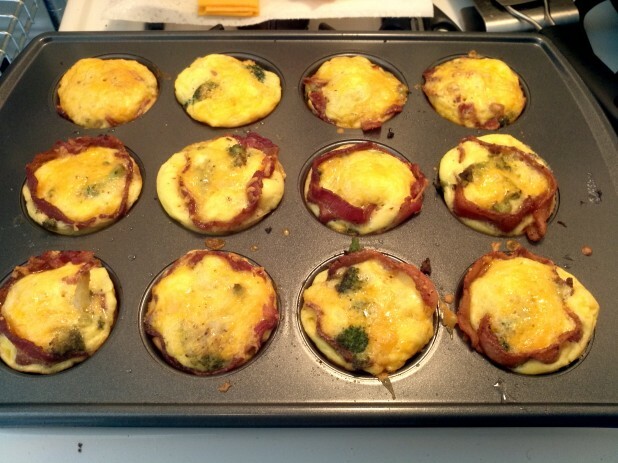 Pingback: Recipe: Bacon Egg Morning Muffins | Low Carb Kitty!Low Carb Kitty! 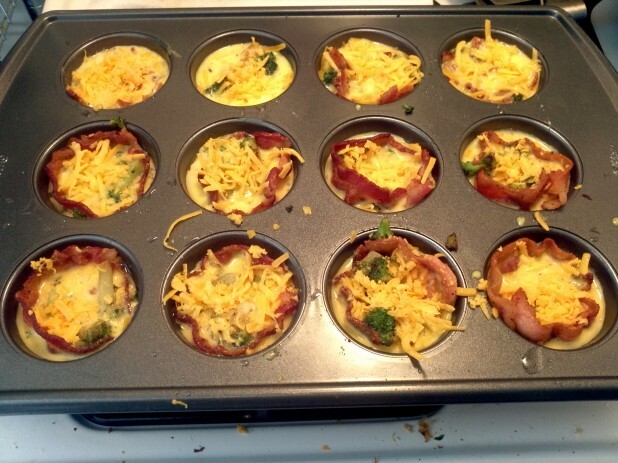 Pingback: Bacon Breakfast Goodness | Beginning a low carb lifestyle.